We paid relatively little attention to MSI motherboards this year, but it's the third largest manufacturer, which has always offered notable models. However, the company really delayed motherboards on new chipsets this year. Besides, there were some holdbacks with shipments to Russia. Now the situation is getting better, and in our turn we are going to fill the gap. This motherboard looks very unusual with its fanciful heatsink. 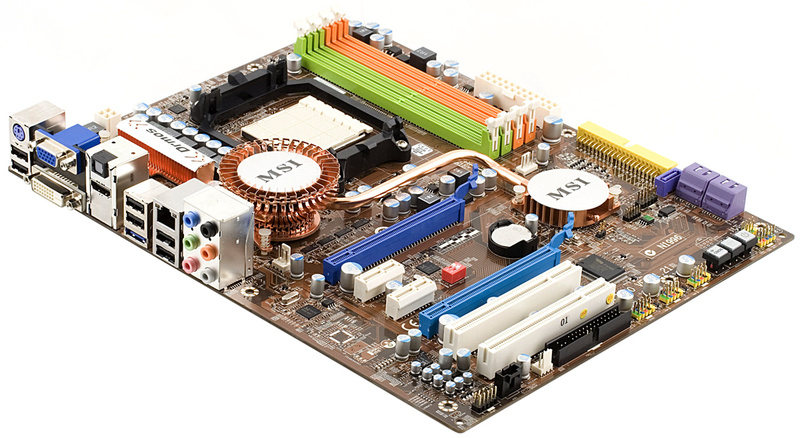 Judging by its characteristics, it's designed for practical users who choose a motherboard for an all-purpose home computer. As our constant readers already know, we've modified our review format. 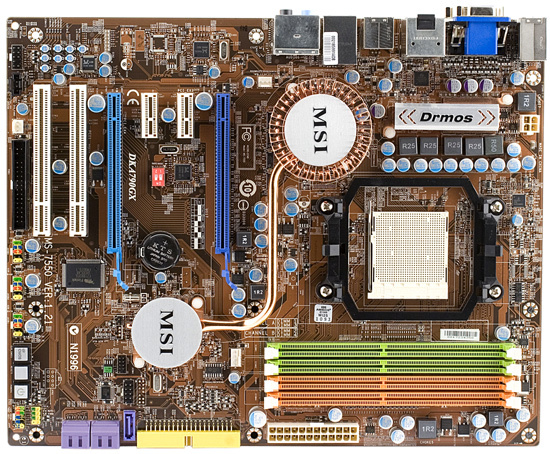 The board has a traditional layout for Mid-End and High-End products with several graphics ports, PATA/SATA connectors placed horizontally at their tail. As a result, we have optimal space usage, these ports are not crowded elsewhere, and it's convenient to plug cables to them regardless of a graphics card's cooling system or dimensions. 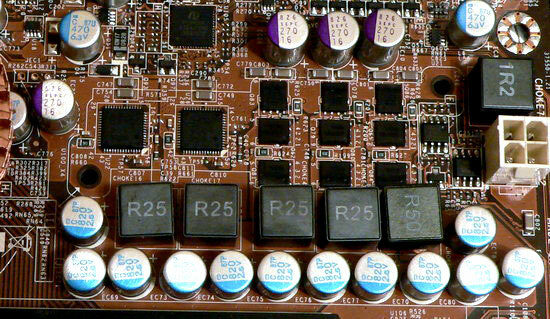 Fortunately, placing graphics ports at double space is also a standard feature for motherboards with the 790GX chipset. If two cards with dual-slot cooling systems are installed, a ventilation gap is required to maintain optimal temperature of the first card and thus minimal noiseless speed of its cooler. A switch between the graphics slots allows to overclock the system on the hardware level by raising the reference clock rate by 10, 15, or 20%. Frankly speaking, we doubt that it's very useful. BIOS in all modern motherboards of this class allows to adjust this parameter in a much wider range at a minimal step, this one is not an exception. Perhaps, only seasoned overclockers who did it with ten-year-old motherboards will appreciate this nostalgic feeling and play with this switch. No other ideas come to our mind. What concerns power/reset and Clear CMOS buttons, they are very handy from the testers' point of view. The board has an unusual cooling system. 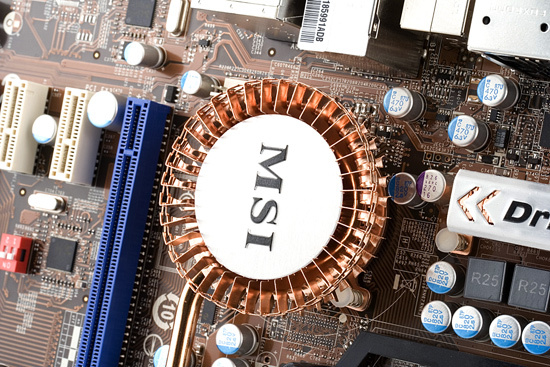 MSI stresses that the shape of the NB heatsink is not only decorative, but also very effective. It's hard to say whether it's true. But those round caps (marked MSI) on both heatsinks apparently do not contribute to better cooling. We can only hope that coolers will make the air flow horizontally and drive it through these heatsinks. However, this chipset can survive decorative cooling systems. Besides, plates of the main heatsink stand proud from the MSI cap. On the whole, we have no gripes with this cooling system, it keeps the temperature within average limits even with the overclocked GPU. 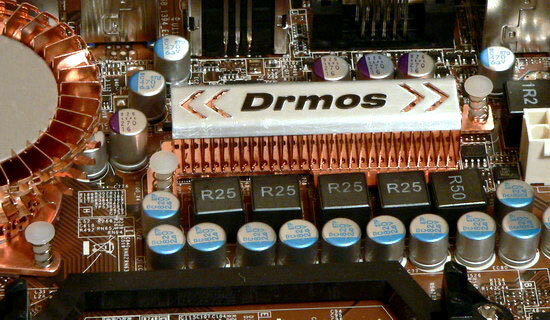 A heatsink on VRM chips remains barely warm with a CPU, which TDP is below 125 W. But it may grow hot during overclocking. Those promised 140 Watts are apparently provided without a safety margin. That is there shouldn't be any problems in the nominal mode, but VRM cooling may become a weak link in case of significant overclocking and raised voltage. We'll talk about overclocking in more detail below. And now let's take a look at the VRM. Most Mid- and High-End motherboards from MSI use Renesas R2J20602 chips instead of the classic circuits with MOSFETs and drivers in each channel, which already incorporate both elements. It's a more compact design. And owning to higher conversion efficiency, each phase can process higher currents. But this board uses a hybrid design -- two channels out of five come with such chips, and the remaining three use three modern Low RDS (on) MOSFETs (4837NH and 4841NH). By the way, Gigabyte has been using such components in its boards for a long time already. Capacitor capacitance is also sufficient: 12 x 820 uF and 5 x 270 uF. All capacitors are solid-state models made in Japan. There is reason to believe that this design should provide a good safety margin for overclocking. Let's hope that the heatsink is up to the task as well. The motherboard comes with a good bundle, which includes a bracket with two extra USB ports and special connectors to hold together cables from the front panel, so it's more convenient to plug them. 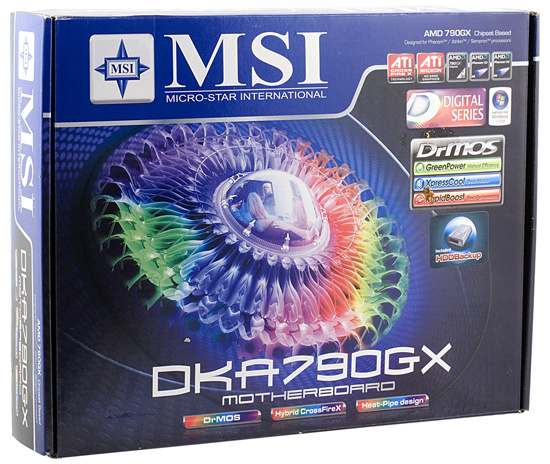 MSI traditionally ships two CDs with drivers (for Windows XP and Vista). Unfortunately, the utility that automatically updates drivers and BIOS does not accept downloaded BIOS images (which are hard to find on MSI website at that). That does not seem the best move, as not all computers are plugged to the Internet by default. There is just no need in some cases, and sometimes it makes sense to delegate the task to a utility that can resume broken downloads. But still, a user will have to organize direct access to the Internet to update BIOS in this motherboard.